Hello, I hope everyone is having a lovely weekend. Just one stamp to show. I chose this because I am off to Sydney in 12 hours or so and this place McMahon's point is near where I will be staying. A lovely area I might add. 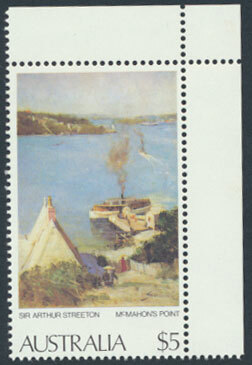 It was issued in 1979, one of the stamps issued by Australia in the 1974 - 1979 Paintings series. The art, as you might see or know anyway, is by Sir Arthur Streeton. A well known Australian artist, and an artist worth reading about if this interests you. I will be back late next week, hopefully I will have a few new Australia issues to show. We will also be mailing all orders from Sydney - as we are going there early next week. 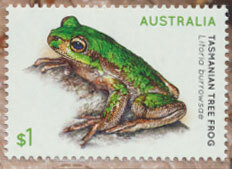 There are over 9000 Australia stamps to chose from and all recent listings have both Scott and SG catalogue references. Lots of perf differences, various printing varieties and more. Please enjoy looking and we hope adding to your collection. Best wishes Michael cddstamps.com for GB and British Commonwealth. Hello, a longer piece but I hope you enjoy it and the stamps. Royal Mail recently issued a set of 6 stamps in se-tenant pairs to commemorate the 250th Anniversary of Captain Cook’s first voyage to Australia and New Zealand. I rather enjoyed seeing the designs. They came across to me as fresh and innovative. Certainly, to me anyway, a credit to the designers for capturing many aspects of Cook’s travels. 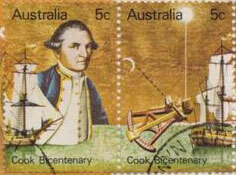 I did think I saw a few similarities with past Cook related stamps, although perhaps that is not surprising. I also wondered how many Cook issues there had been, why I thought this I have no idea. But I did. So after 2 minutes of research I discovered there are over 600 stamps, pre-stamped envelopes and private labels. It must be over because the materials I read were dated 2011. All credit for this goes to Brian Sandford and some excellent research documented in his publication here I found this link from The Captain Cook Society website . You can see it here https://www.captaincooksociety.com/home/collectables/stamps#stamps. I recommend a read if you want to learn more about the many Cook issues. My thanks for the very interesting body of work the Captain Cook Society have made available to us all. 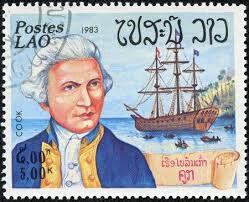 You will also find a listing (dated 2000) of over 400 stamps, provided by the late Ad de la Mar, of the Flora, Fauna and Birds seen during Cook’s voyages. But, as I say I thought I saw in the new Royal Mail issue some designs I had seen before, or at least aspects of the designs I had seen before, so here are a few. I guess with so many issues over the years it is not surprising and also interesting, perhaps? to see how design styles have changed. Obviously with over 400 stamps I have only chosen a few to show. I show these not with a critical mindset but because I see the Royal Mail designs to be far more inspiring and pleasing on the eye. To start with here are two from Australia, from the 1970 commemorative issue and one from Laos. The sharp eyed among you will note the Laos stamp is from a 1983 issue commemorating explorers and their ships, in this case HMS Resolution (Cook’s second ship) , not Endeavour, the ship Cook sailed in 1768 -1771 to Australia and New Zealand. I include it just to show the design content. And these below I think are interesting because of the similarity in the portrayal of the Maori chief. 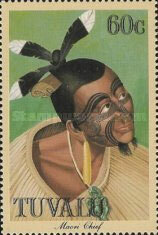 The Royal Nail 1st Class stamp shows a portrait of a Maori Chief with full facial moko (tattoo) while the Tuvalu stamp from the 1988 Voyages of Captain Cook commemorative issue is described as showing “a Maori Chief”. Not surprising they should have similarities of course but that the subject as used on the Royal Mail issue is in the same positional style. Or perhaps not? Finally two stamps to show the flora, to which the credit goes to Joseph Banks for the research and the artist Sydney Parkinson for the illustrations, is represented on one of the 2nd Class stamps. The specimens found and illustrated made up the first major collection of Australian flora, many were new to science. There is very little similarity in the design of the stamps but I am showing them because I think the Royal Mail design best captures the theme. In summary, to my eye at least, from all the Cook issues I have looked at while reading about this commemorative theme I think the Royal Mail issues are far superior to anything produced before and a lovely set to add to any Cook collection. Hello, just one stamp to show tonight. I hope you like it. It shows Mount Kilimanjaro in Tanzania. I have never been and one day would like to see this. Strikingly beautiful by all accounts. Mount Kilimanjaro has three volcanic cones. It is a dormant volcano, the last eruption was some millions of years ago I think. It is the highest mountain in Africa at about 19,000 feet above sea level and part of the Kilimanjaro National Park. 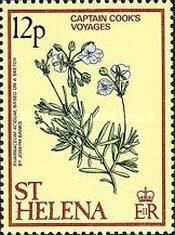 For now I will just enjoy the stamp and dream of travelling there to see it.